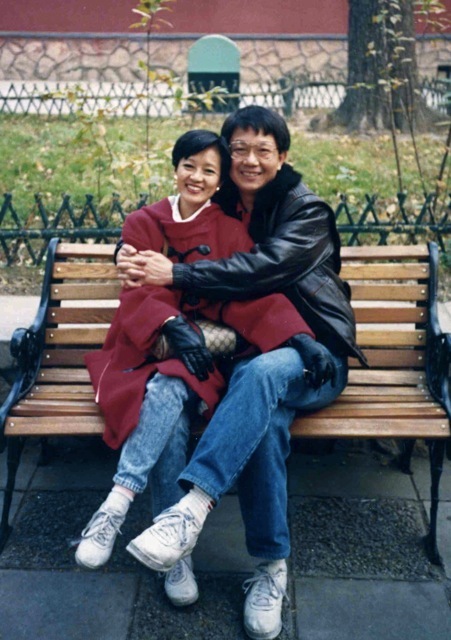 Sally and I moved to Hong Kong in 1989 for me to take up a job at the Chinese University of Hong Kong. 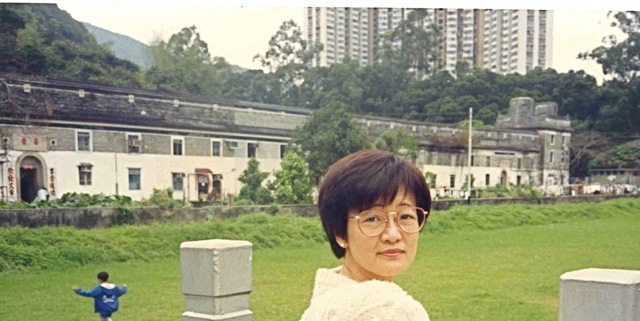 Subsequently, I worked as General Manager for AT&T in Guangzhou, then retired and stayed in Hong Kong for the last 9 years. 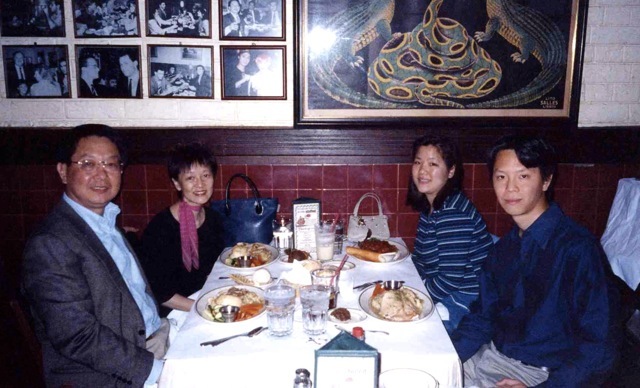 As we age, we feel the strong need to reestablish closer contact with our families and old friends in the US. We enjoy living in Hong Kong and take full advantage of its offerings, its cosmopolitan lifestyle, ease of travels, good food, great infrastructure. The only thing we dislike is the increasing air pollution. But now we have to say a reluctant good-bye to this vibrant city and the many friends we made in Hong Kong. 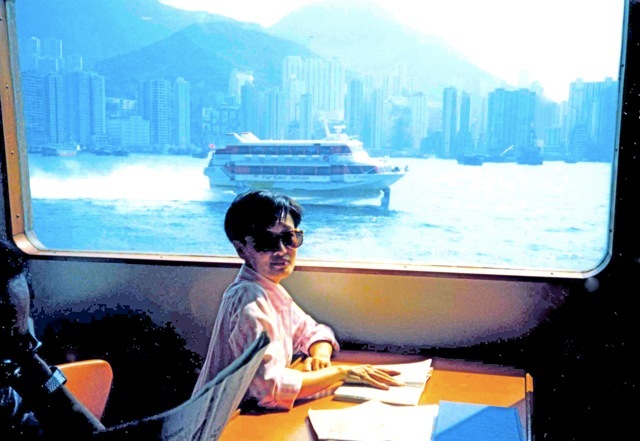 Twenty years ago, Sally was flabbergasted by the futuristic sights of Hong Kong, not that New York was a mediaeval town. She was impressed by the elevated highways zipping through high rise buildings, a few feet from their windows. She was also impressed by the fast hydrofoils that flied to Macau in an hour. 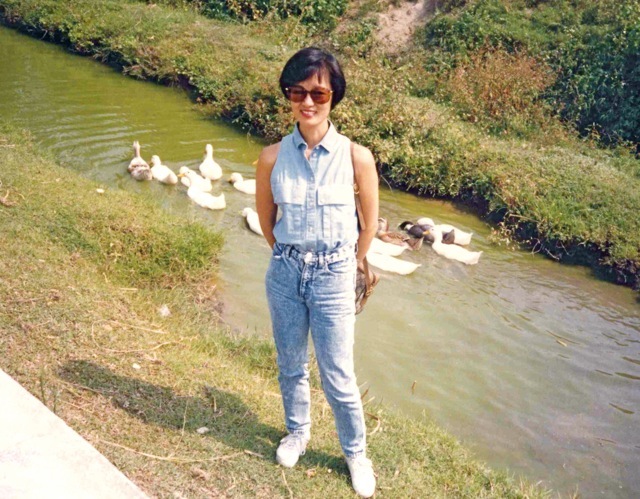 We lived in a comfortable flat on the campus, with an unobstructed view of Tolo Harbor. On a clear day, we could see China from our living room. In the early 1990s, we saw fast boats with 1,000 HP engines zip around, smuggling goods into China. Once, when these speed boats docked on shore, a HK marine police boat approached them. The speed boats scattered in seconds, and one even looped around the slow police boat as a taunt. Our flat also gave us dramatic scenes as a typhoon was ready to strike. 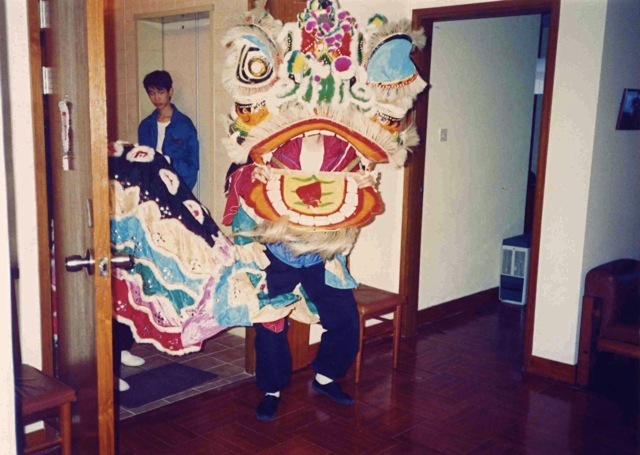 On Chinese new year, lion dance would come to dance in our flat and deliver good luck. 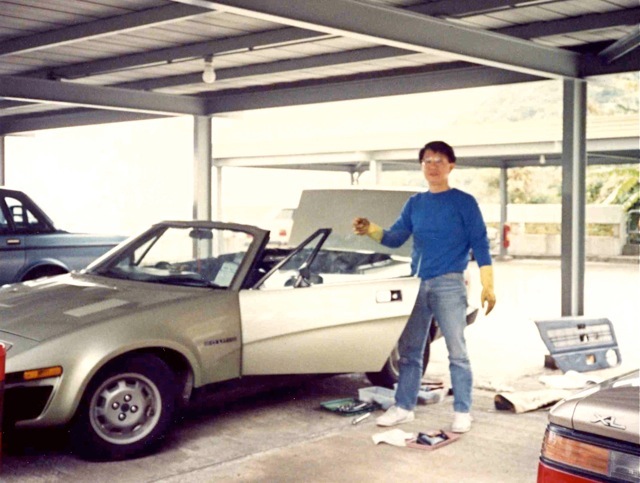 I indulged in a Triumph sports car. It was old and needed constant attention. I worked on this car every Sunday and changed everything except the engine. But when it ran well and zipped on the highway with wind in my hair, all my hard work was well worth it. Sally went back to the village where she was born. The wide clear stream where she played shrunk into a narrow brook because the stream was dammed upstream. She was disappointed to see the pristine setting of her childhood disappear. 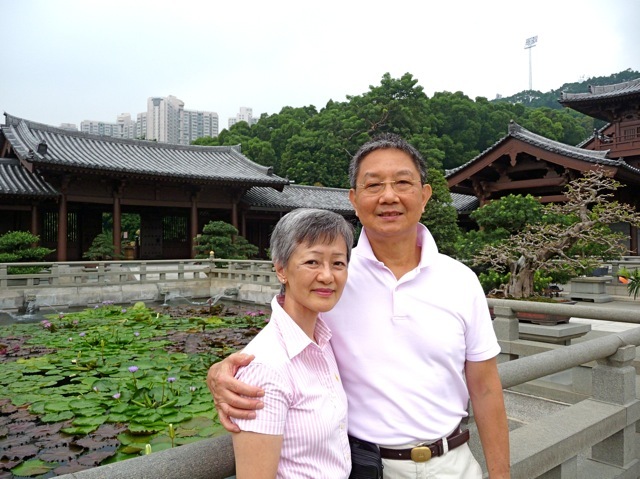 We took trips from Hong Kong, a central location to travel to all parts of Asia. Here, she was thrilled by the well behaved children and startled the kids by her warm gestures. 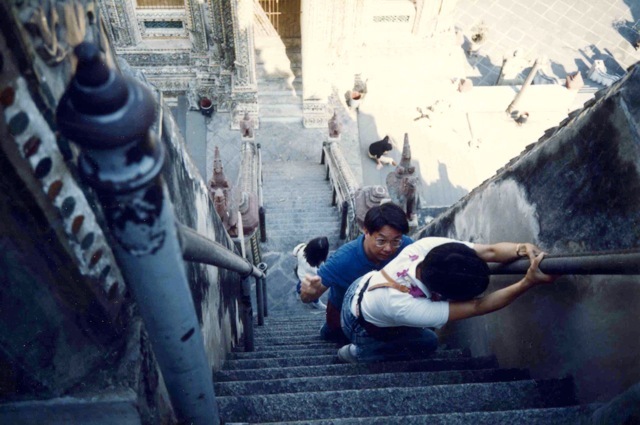 In Bangkok, we had to climb almost vertically up a pagoda. In Beijing, we enjoyed a moment of endearment. Our son and daughter came to visit us frequently. Otherwise, we would travel to US to visit them. We kept constant contact through the years. 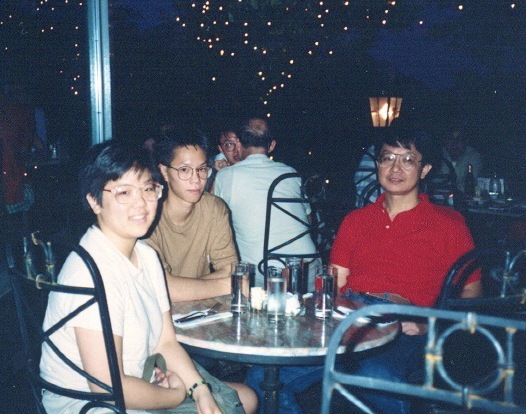 When we lived in Guangzhou (Canton), we lived in an apartment in the White Swan Hotel. The hotel is situated by the Pearl River, giving us a great view of the city. Here, a barge was on fire for half an hour before it was put out. 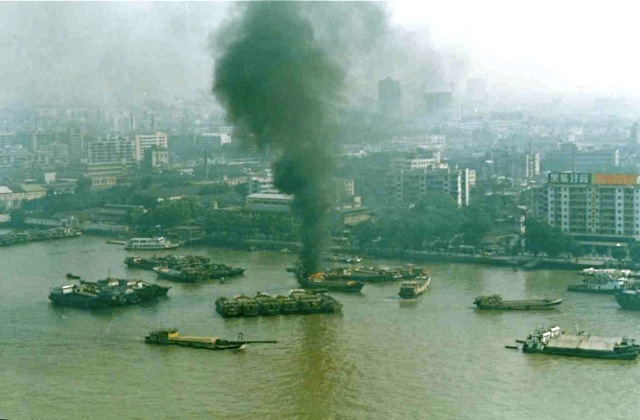 On Chinese new year, fireworks were shot up from barges on the river. They shot up 200 feet and exploded right in front of our windows. We could feel the air pressure from the blinding exploding fireworks and feared the windows would crack. We bought into a golf club in the center of Guangzhou. We played a few times on the green above the tall buildings of the city. The summers get hot and are not suitable to outdoor sports. After the tour of duty in Guangzhou, we returned to Hong Kong. Due to the timing of our return, we bought our flat at the top of the housing bubble and bought ourselves a small two bedroom flat. 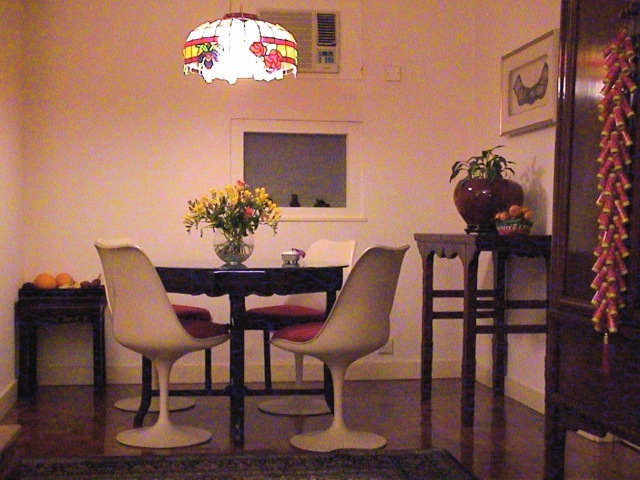 We decorated it with antique Chinese furnitures we bought in China, and it has been very comfortable to live in. 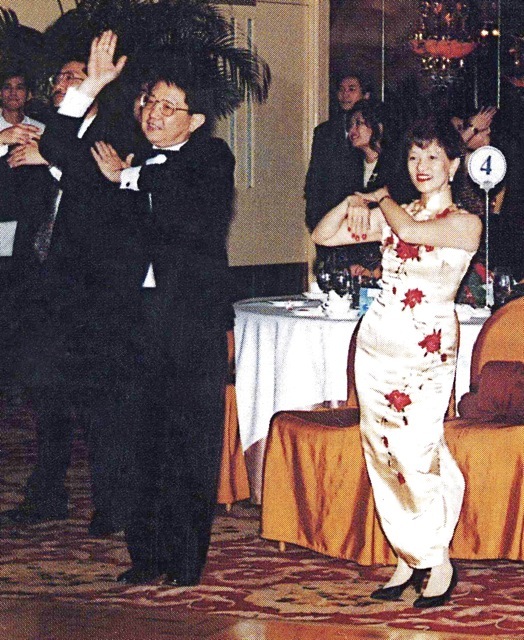 Being the headquarters of Asia/Pacific, the Hong Kong office had frequent company functions. Here, we danced at the company Christmas dinner dance. For the first 10 years, we had very good luck and usually won door prizes at such dinners. Then in the last 10 years, our luck went out and we seldom won door prizes. 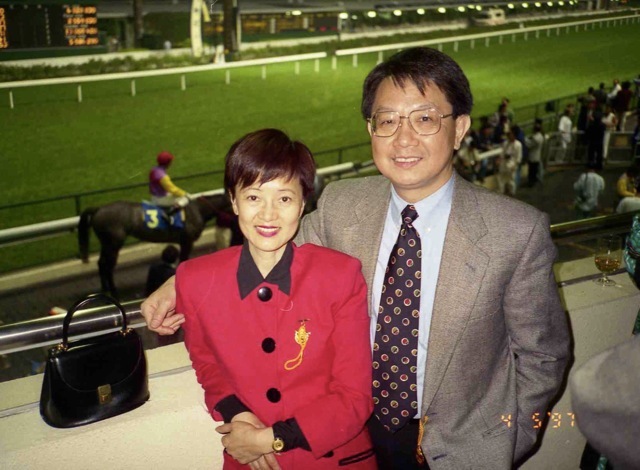 As a member of the Hong Kong Jockey Club, we frequently went to use its recreational club facilities. Since we usually lose, we don’t gamble. Its race course is one of the biggest revenue race courses in the world. At US$10 billion/year, the HKJC revenue is approximately the same as the combined revenues of 167 race courses in the US. 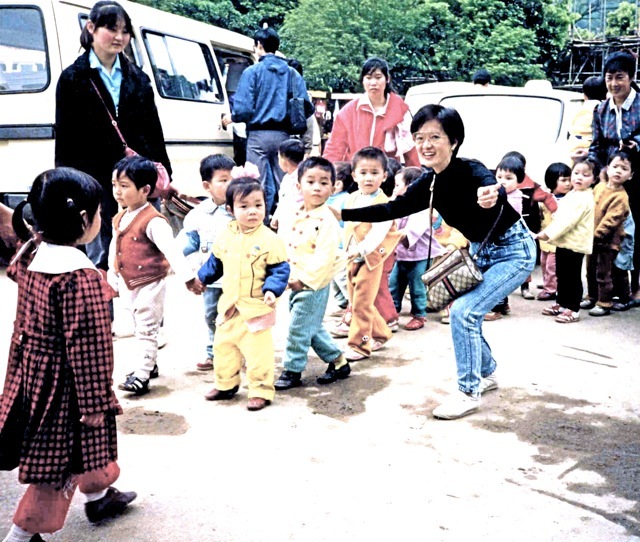 Being a non-profit organization, HKJC is the biggest donor to all charities in Hong Kong. One year, I sewed costumes and we went to a halloween party. 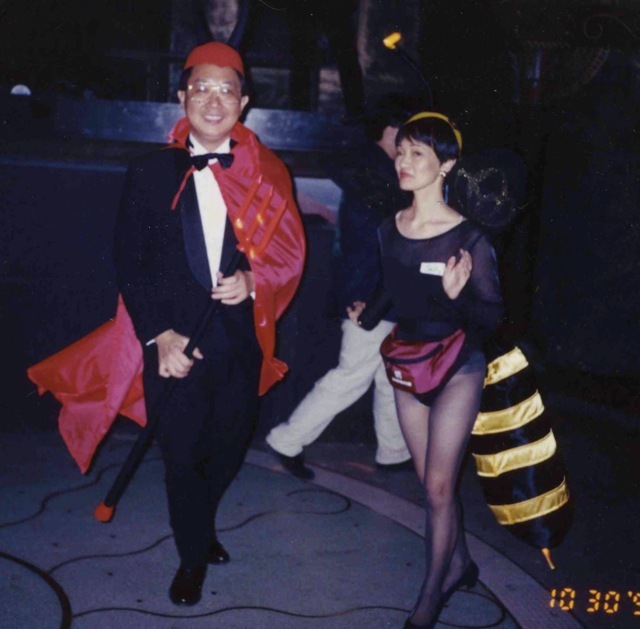 Sally was dressed as a bumble bee with lit antennas, and my devil’s outfit had a long stiff tail. Attendees felt we should have won the costume contest, but it was rigged and some young girl won the prize. Among tall buildings, some old houses remain. This big Hakka complex was built hundreds of years ago and housed dozens of families. 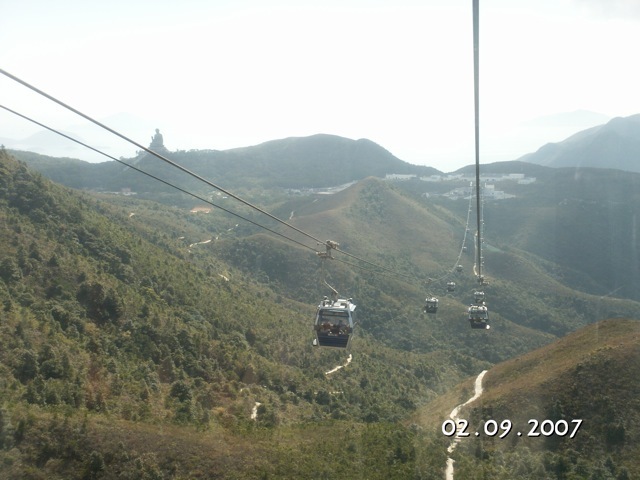 We took this long aerial tram to visit the big bronze buddha on a mountain top. One of the greatest joy of living in Hong Kong is the good food. 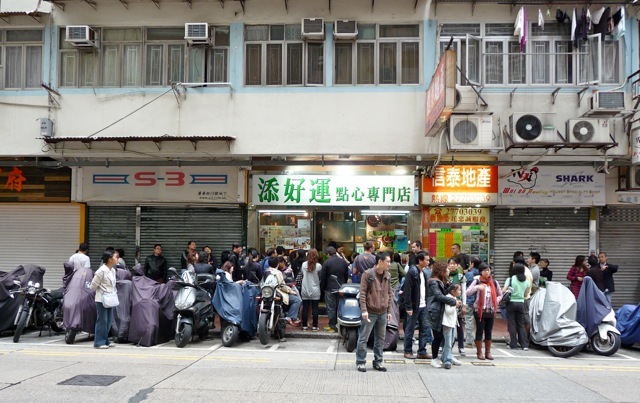 This nondescript dimsum restaurant was rated one star by Michelin and attracted droves of customers. We had to wait over two hours for a small table. The food was good, but we would not wait another two hours as there are many other excellent restaurants without the wait. 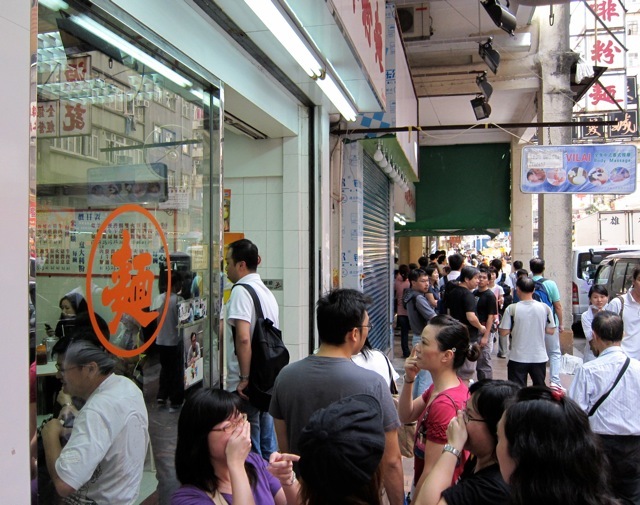 Restaurants in Hong Kong range from very cheap to very expensive. But the price is not the determinant factor of their taste. Some very inexpensive restaurants serve delicious food, while some expensive joints serve mediocre food. So searching out for the best restaurants becomes an obsession. Good restaurants gain reputation by word of mouth and personal experience. This WaiKee (維記) restaurant sells only noodles in liver soup. But it’s so good it expanded into three shops on the same block. Dozens of people often wait patiently outside each shop, and I join them almost every week for my fix. 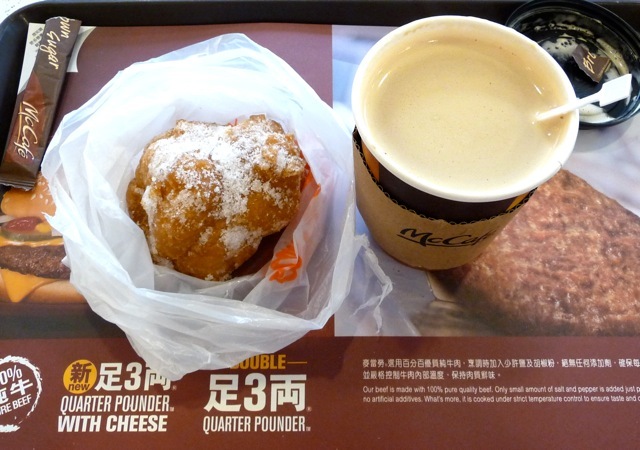 One joy in my life is a good cup of coffee and a sugar coated eggy donut (沙翁). Recently, I find the coffee served at McCafe to be very good. Bryan and Tammy joined us for a Thanksgiving dinner one year. Hong Kong offers other exciting things to do. One of them is watching the building and dismantlement of bamboo scaffolds. 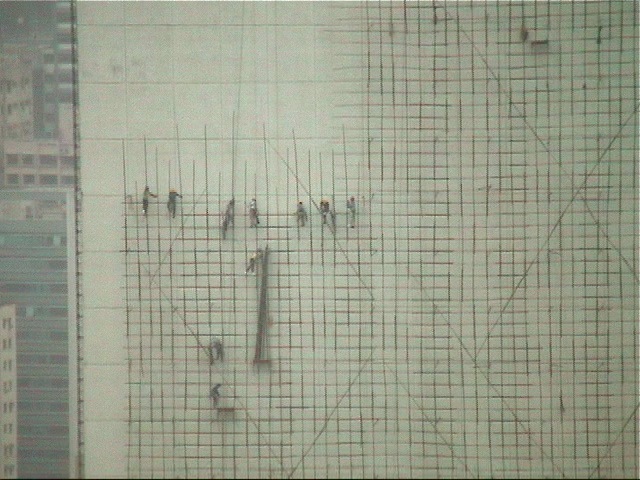 These men work hundreds of feet above the pavement to build a flexible scaffold. 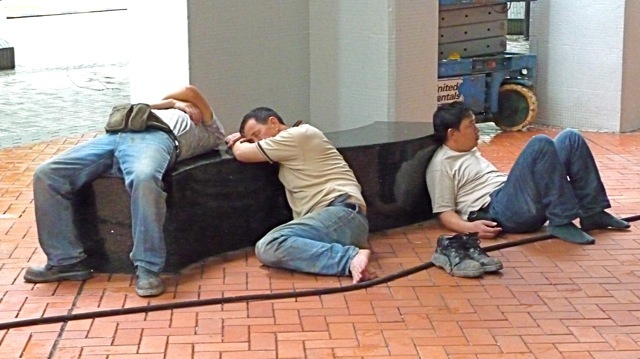 Most Hong Kongers work hard. These laborers flopped down and napped during their break. The competition for business is keen. 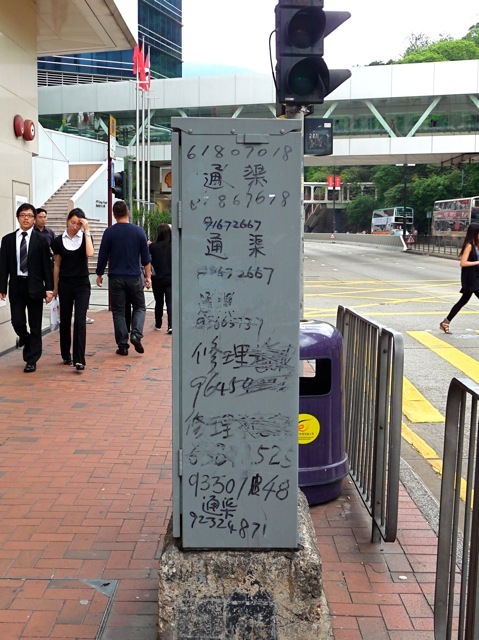 Itinerant sewage cleaners use graffiti to advertise their work, and resort to erasure of competitors’ ads to compete. 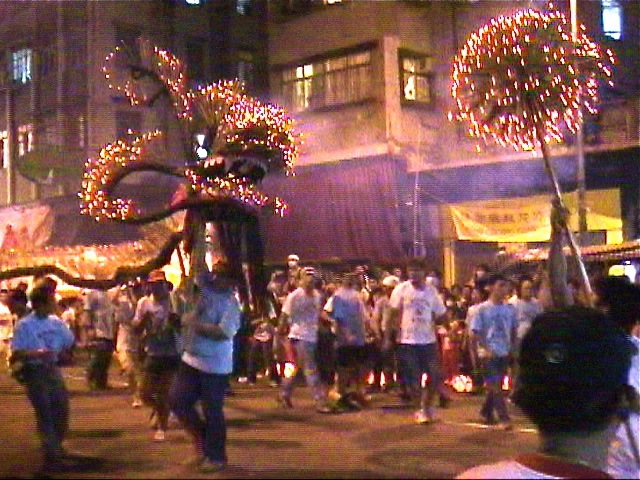 At the height of the SARS epidemic, Hong Kongers brought out the incense-covered dragon to ward off the demon of disease. 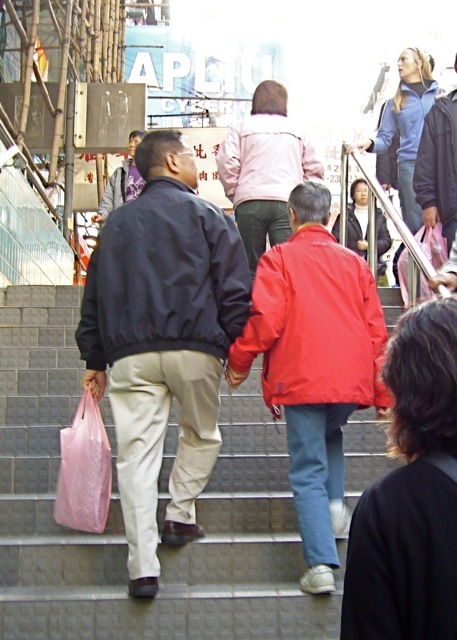 Many Japanese and Korean expat families live in Hong Kong. They form their own community and exhibit unusual cohesiveness. 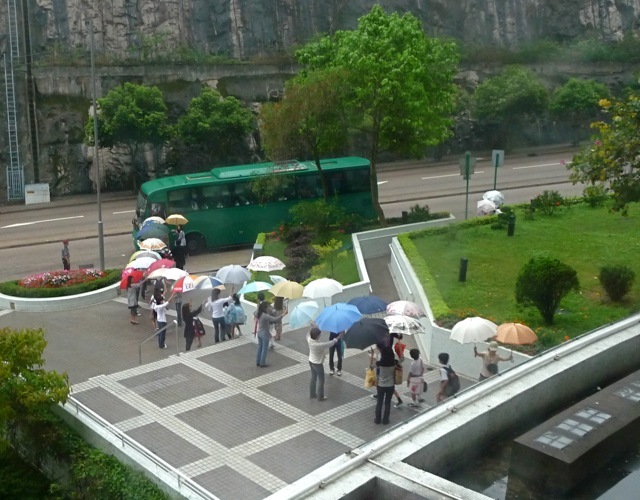 When it rains, Japanese mothers in our estate line up with umbrellas to shield every child walking from the canopy to the bus. They would disband only after every child is out of the rain. Shopping in Hong Kong can be extremely expensive or ridiculously cheap. 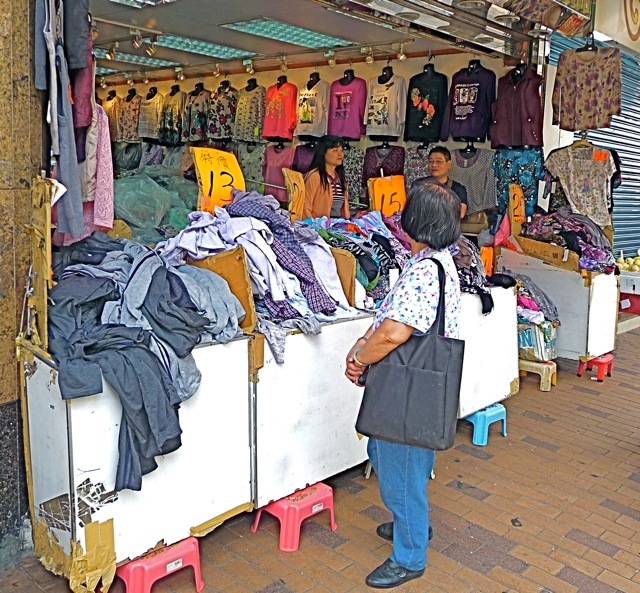 This shop sells clothing for US$1.50 apiece. 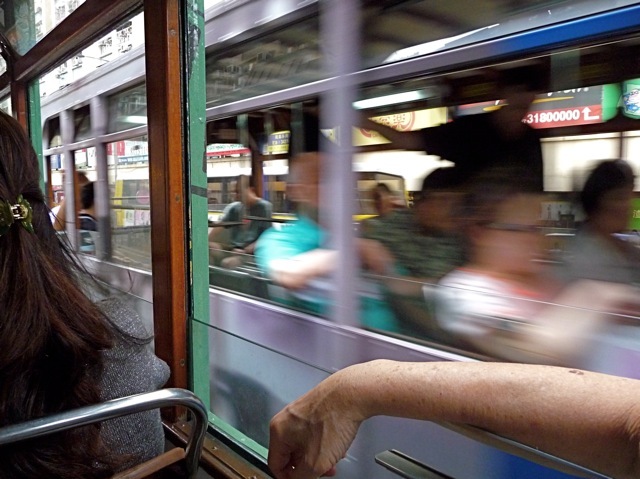 One of my favorite mode of transportation is the electric tram. It is open aired, slow, and cheap. With senior discount, it costs me 15 US cents to ride as far as I like. I could shake hands with passengers on the oncoming tram. 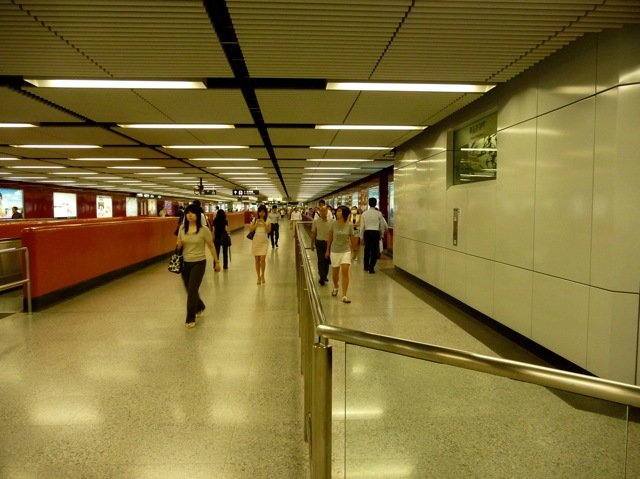 Hong Kong’s subway system is clean, quiet, air conditioned, and fast. Here, paid area is separated from the non-paid area by a low barrier. MTR trusts Hong Kongers to be orderly and would not jump over the barrier. These modes of transportation notwithstanding, Sally and I often walk from point A to point B. The frequent climbing of stairs make for good exercise. Sally complains I walk too fast and drag her along. 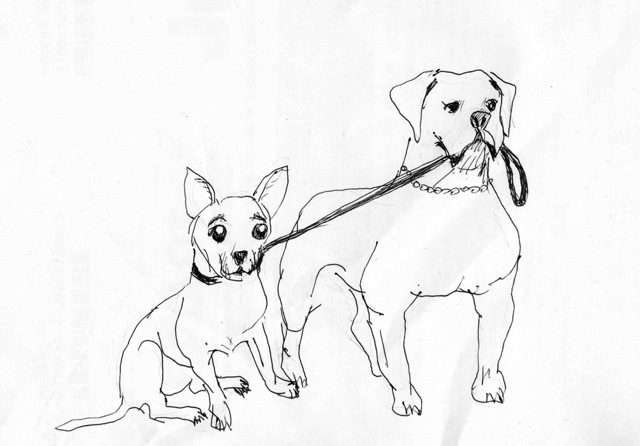 I drew this drawing and asked her if it illustrated what she meant. The chihuahua concurred. In the last few years, we decided to let our hair go naturally grey. We are aging and there is no point in hiding or denying it. 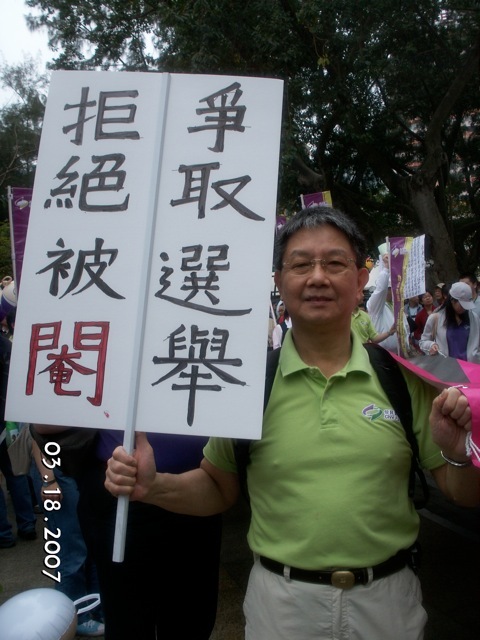 As a firebrand, I joined marches in Hong Kong. 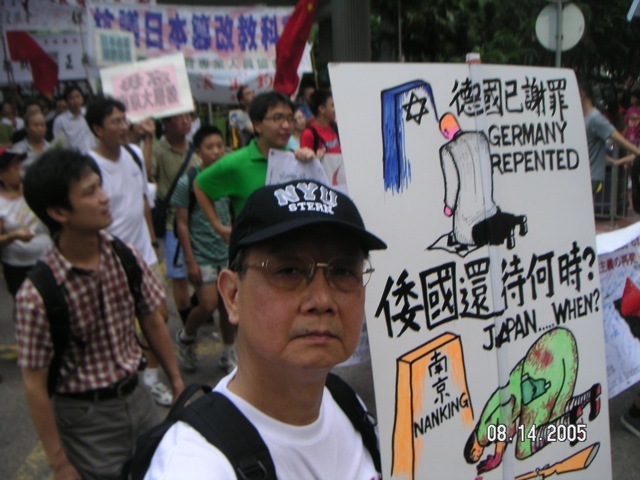 Besides the annual June 4th vigil, my pet peeve is the Japanese denial of its atrocities in China. Another topic is universal suffrage in Hong Kong. As promised by China in the HK mini-constitution before the reversion to Chinese sovereignty, Hong Kongers are entitled to democracy. But the HK government and Beijing are dragging their feet in implementing this promise. 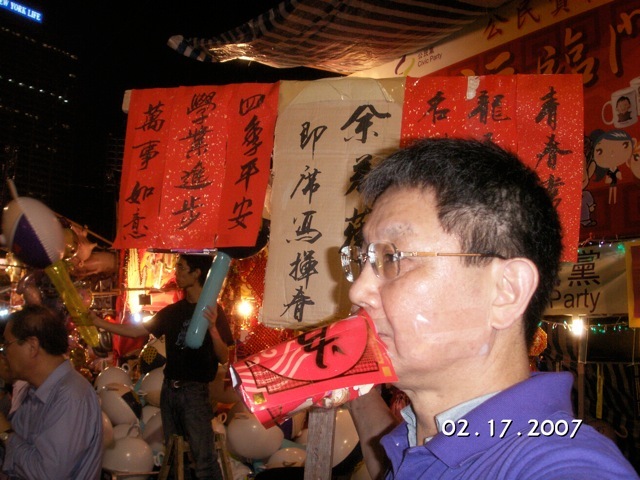 I taped a makeshift loud speaker to my face to promote fund raising for the Civic Party at the Chinese new year fair. 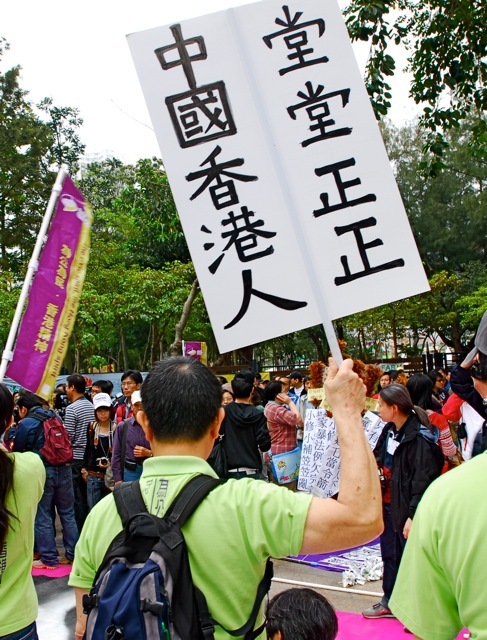 Civic Party is actively promoting universal suffrage in Hong Kong. Our son Bryan and our daughter-in-law Thy visited us in Hong Kong. They made Hong Kong their last stop after roaming through India and Southeast Asia as backpackers. 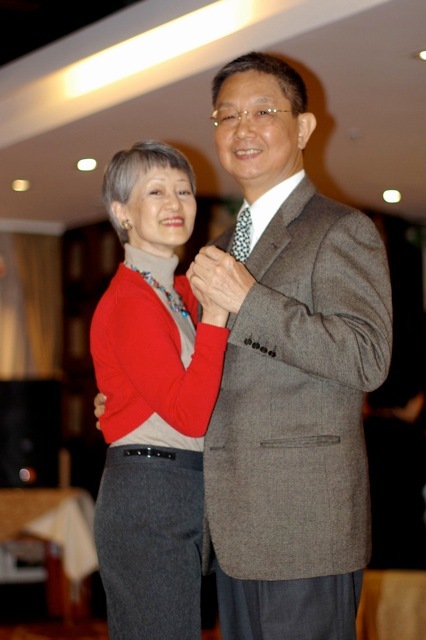 After 20 years in Hong Kong, Sally and I enjoyed a dance at a Christmas dinner dance of our neighborhood. We enjoyed Hong Kong, and we will miss it and our friends. 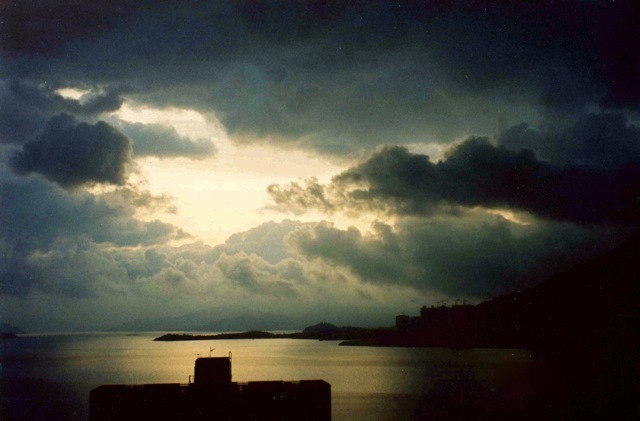 This beautiful scene of HK harbor at dusk will remain in our fond memory. 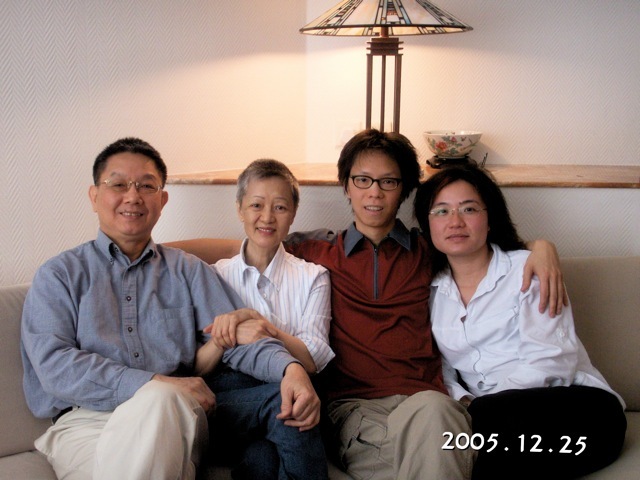 Posted by Robert Wu on Wednesday, February 17, 2010, at 9:49 pm. Filed under Uncategorized. Follow any responses to this post with its comments RSS feed. You can post a comment or trackback from your blog.